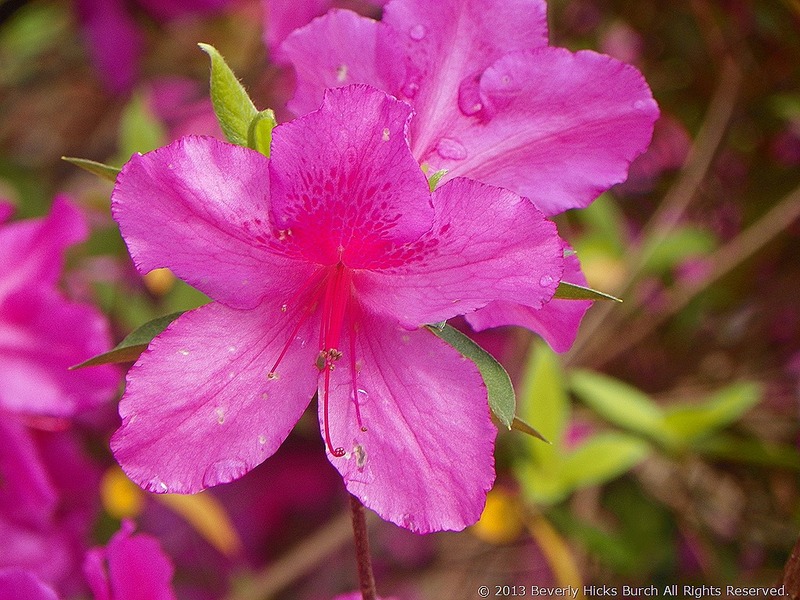 Azaleas are the quintessential Southern icon…well, along with the magnolia tree. Azaleas are to the South what tulips are to Holland. I don’t think I’ve ever met a Southerner who at least didn’t appreciate these wonderfully, colorful shrubs that put on a Technicolor display every spring. Even if that person doesn’t know the name of the of the shrub, they still enjoy the show. When I moved, it was to a home that needed major restoration inside and out. A mother and three teenage daughters had lived in the house for 5 years. They were clueless to home repair. The back yard had been mowed once in those 5 years. Hand to God, that is true…the former owner told me that with her own lips. And, then would could begin with the good stuff. Azaleas were on the top of my list. I guess I had 20 or 30 before I left that house. Then, I moved to my current home. The house was a new build, I was just like Miss Maudie…I just had more room for azaleas! But, there came a time when Tall & Handsome and I moved to accommodate his job. Not wanting to sell, we decided to lease the house out. The foundation of the wonderful landscape I started crumbled like an ancient civilization due to neglect…it laid in ruins…gone was the Bermuda lawn, the Japanese Maple tree, azaleas and other wonderful loved plants. I am personally partial to southern indica. (Mine are Formosa.) Most people think I’m fool hardy for growing them in this area, because, they insist, the azaleas are more suited for climates further south. Like Mobile for instance. The theory is a good cold snap could come along and blight the bloom trusses for a whole blooming season. Or, even kill the plant. I grow them anyway. For me the payoff is worth it. The big beautiful blossom and the size of the plant alone is worth the risk. Sometimes and I look out over the yard and get a little overwhelmed at the work still remaining to do…it’s like going backwards…. But, just think, I have room for more of my azaleas now!